At $29.99 (under $1.00 a day) I bought this instant download myself. 17 statistics to monitor on your blog. This doesn’t get into how to set up a blog or choose a theme, but is focused on the writing side and promoting your blog. I’ve seen a lot of pastors who put out random musings, thoughts on life, personal updates, and share what they’ve been reading. But a blog can do so much more in terms of communicating with church members and helping first time visitors find you. I think many pastors don’t realize everything that a blog can do for their ministry. As you read this book, you’ll notice that its is geared towards professional bloggers. 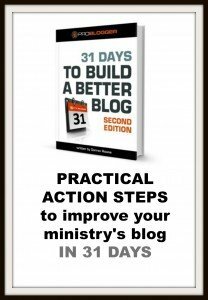 But you will likely be inspired as to how you can take your pastor blog or church to the next level. 31 days with specific action steps each day break it down into simple bite size chunks. Buy your copy here 31 days to a better blog. This book will help you see how you can increase the reach and impact of your church website if it is in a blogging platform. If you think of your church website as a marketing tool, then it should be much more than a brochure site that gives service times and announcements. Think of it as a place where sermon outlines / transcripts can be posted, where your audio recordings can be posted or sold, announcements can be made, upcoming series can be advertised, and so on. The blogging platform can give you a big boost to accomplishing those goal, and this book will help you think about ways to put your content to use. There are no specific examples of church blogs in the book. 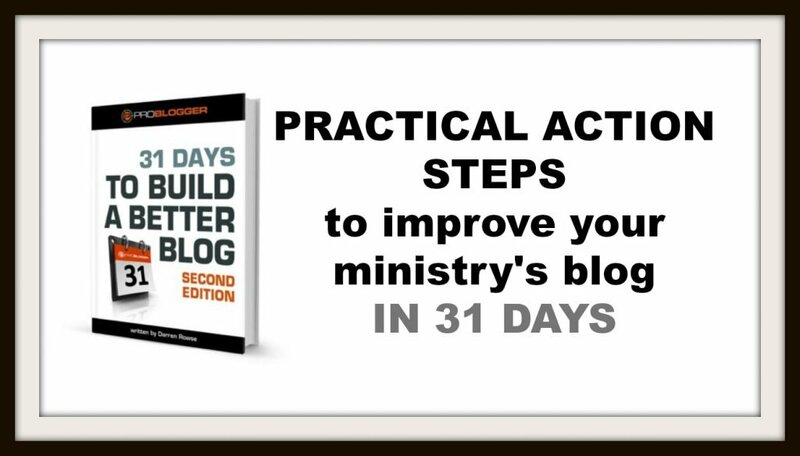 I think you can apply the principles within and be inspired as to how you can take your church blog to the next level. you know we’re a church website builder and we always encourage our pastors to keep the blog current. It is just one of the great tools a ministry can use to reach out to it’s members and visitors.